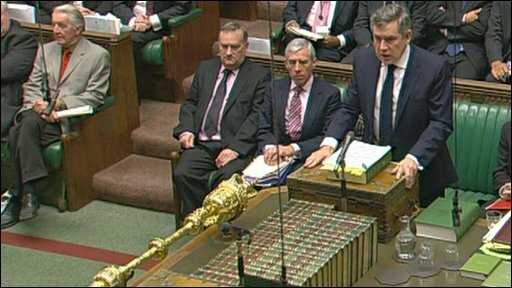 Gordon Brown says the UK will send 500 more forces personnel to Afghanistan - but only if key conditions are met. They will be sent as long as they have the necessary equipment, if other Nato allies boost their troop numbers and more Afghan soldiers are trained. There are currently about 9,000 UK personnel in Afghanistan. The US is expected to announce a substantial increase in its troops next week, the BBC's Newsnight reports. The US says no decision has been made. Newsnight says the Obama administration has already told the UK government it will soon announce a substantial increase to its military forces in Afghanistan. The programme understands an announcement could come next week, in time for a Nato defence ministers meeting in Bratislava. But White House press secretary Robert Gibbs dismissed the report, saying President Barack Obama had not yet made a decision on troop numbers. As well as the 9,000 UK personnel, there are 150 reserve troops in the country which the Ministry of Defence said would be available for further temporary deployments. Some say there's also a wider political reason for announcing this decision now - just as President Obama tries to decide whether to send more American forces or scale back and focus on a narrower mission. Military chiefs welcomed the UK troop reinforcement, insisting their requests had been fully met but opposition parties said more details about the timing of the deployment were needed. Speaking in the Commons, Mr Brown paid tribute to each of the 37 British service personnel killed in Afghanistan since the end of July when Parliament began its summer recess. Describing it as a "solemn moment", he said their sacrifices would not be forgotten. While nothing could "erase the pain" of bereaved families, Mr Brown added that they could be proud of the actions of their loved ones and know that their "influence" would live on. Mr Brown said he was prepared, in principle, to send an extra 500 troops to Helmand Province in southern Afghanistan - where Nato troops are fighting fierce battles with the Taliban - in response to military advice. He said the reinforcements, which would increase overall UK numbers to 9,500, would happen only if troops had the equipment and training necessary to perform the tasks asked of them. Two additional Merlin helicopters would be sent to Helmand in the near future, he told MPs, while more armoured vehicles and other specialist equipment would be provided to counter the threat of roadside bombs. He also insisted Nato countries must bear their "fair share" of the mission by sending more troops of their own and the Afghan government had to substantially increase its own troop presence in Helmand. Only if he received such guarantees, Mr Brown said, would he be able to "justify" sending more troops. Downing Street later said it believed the conditions for sending more troops were "achievable" and it hoped this would happen as quickly as possible. Conservative leader David Cameron and Lib Dem leader Nick Clegg paid tribute to those who had lost their lives. But Mr Cameron said the welfare of British troops returning from combat needed to be "fundamentally re-examined" with more resources for helping the badly injured. He also said it was "totally unacceptable" that some were not properly prepared for going to Afghanistan, mentioning the case of a Territorial Army soldier he said had told him he was not getting full training or pay. Mr Brown said he would look into such claims but said he was confident that troops now in Afghanistan were "properly resourced". Mr Clegg welcomed the imminent arrival of more helicopters but said there must be be a "radical" change of strategy in Afghanistan with more emphasis on political reconciliation. And Mr Brown faced criticism from his former defence secretary John Hutton who said it would have been "much more helpful" to have sent the extra troops six months ago. British forces have been in Afghanistan since October 2001 and besides the US, the UK has the second-largest contingent of troops there. Military commanders have said extra troops are needed to build on the progress of Operation Panther's Claw, which saw UK forces help expel insurgents from key areas this summer. Given the conditions placed on their deployment, the BBC's defence correspondent Caroline Wyatt said it was unlikely the extra troops would be in Afghanistan soon. But the announcement did send a clear message to the US as it reviews its Afghan strategy, she added. US President Barack Obama has been considering future troop options after a request by General Stanley McChrystal, the commander of international forces in Afghanistan, for what has been widely reported as up to 40,000 more Nato troops. The White House welcomed the UK's troop pledge as a reflection of its "continuing commitment" to the mission. The question of UK troop numbers in Afghanistan has become highly politicised in recent months. 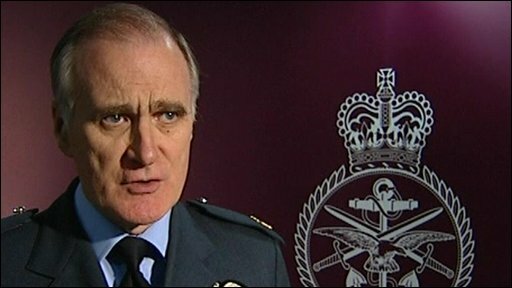 Sir Jock Stirrup: "This is what our troops on the ground require"
The ex-head of the Army, Sir Richard Dannatt, has claimed that No 10 turned down a request to send up to 2,000 more troops earlier this year - a suggestion Downing Street has denied. But Chief of the Defence Staff, Air Chief Marshal Sir Jock Stirrup, said the 2,000 figure was a "myth" and suggested that commanders had been pushing for a total force of 9,500 troops all along. "We never asked for 2,000 additional troops," he said. "We set forward a recommendation with clear military advice on what was required....Over the course of the year we have moved to the figure of 9,500 which is, essentially, the military advice we started off with." He added: "This is what we have asked for and this is what we have been given." Some 221 British servicemen and women have been killed in Afghanistan since 2001. Over 40 countries contribute forces to the international mission in Afghanistan. Full details on the Isaf website.